So you have your scenario and you have planned out your session, but how do you ensure that your simulation session is effective? In this workshop, we will review the concept of fidelity, or how a scenario can be made realistic. We will address the roles that equipment, environment, and psychology play in fidelity. Discuss common challenges and practice dealing with unexpected developments. UCSF is accredited by the Accreditation Council for Continuing Medical Education to provide continuing medical education for physicians. UCSF designates this live activity for a maximum of 277 AMA PRA Category 1 Credits Physicians should claim only the credit commensurate with the extent of their participation in the activity. 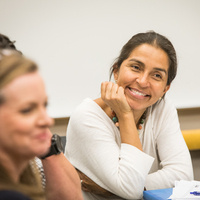 The above credit is inclusive of all UCSF Educational Skills Workshops and the Teaching Scholars Program. Credit available for this event only is 2 AMA PRA Category 1 Credits. For the purpose of recertification, the American Nurses Credentialing Center accepts AMA PRA Category 1 Credit issued by organizations accredited by the ACCME. The California Board of Pharmacy accepts as continuing professional education those courses that meet the standard of relevance to pharmacy practice and have been approved for AMA PRA Category 1 Credit.